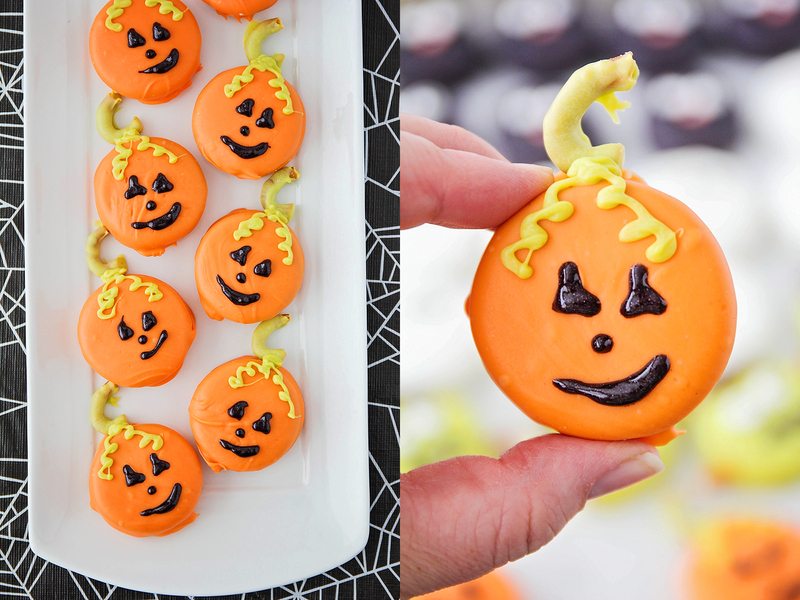 These adorable and delicious Halloween Oreos are so fun to decorate! 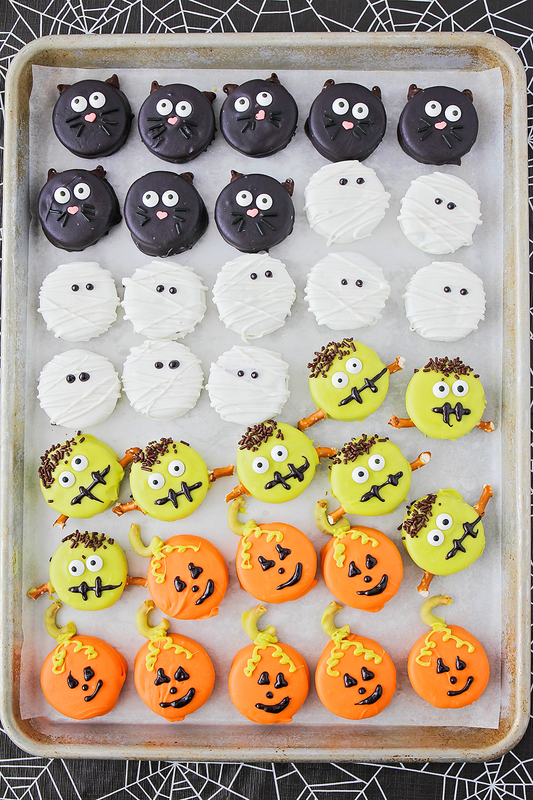 I've totally been on a roll with the Halloween projects lately, and I'm so excited to share these Halloween Oreos with you! A few years ago, I started dipping Oreos and other treats in chocolate to share with friends and family at Christmas, but this is the first year that I've tried Halloween designs. They turned out so incredibly cute, and I think they will be perfect to share with friends (if we don't just eat them all ourselves). The best part is that they're super easy to make! I made all four varieties in about an hour and a half (and spent part of that time breaking up fights between my naughty children). They're so fun, and so easy to customize in any way you can imagine! It's hard for me to pick a favorite, but I think these Frankenstein's monster Oreos might be it. I love their goofy little faces! I will confess that I wish I had gone the extra mile and picked up some pretzel sticks at the grocery store, instead of chopping up the pretzel twists I already had in the house like the lazy person I am. They're still super cute, though! Prepare a baking sheet by lining with parchment paper. Melt the candy melts in a microwave safe bowl at 50% power, stirring every thirty seconds, until completely melted. Dip the Oreos in the candy using a fork, coating them completely, then tap the fork on the side of the bowl a few times to shake off the excess candy. Gently place the Oreos on the prepared baking sheet. Place two eyes on each Oreo, sprinkle brown sprinkles on top for the hair, and place a pretzel piece on each side for the neck bolts. Let cool and harden, then draw a mouth with the sparkle gel. These jack o' lanterns were my daughter Abby's favorite, mostly because of their silly little faces. 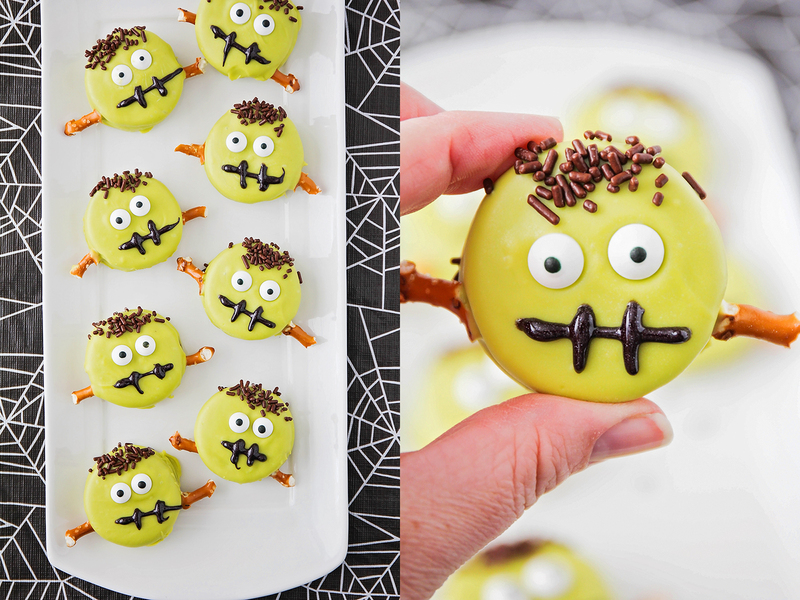 I made the stems from the rest of the pretzel pieces that I had chopped up while making the Frankenstein's monster Oreos, and used the already melted green candy melts from those as well, so they were pretty straightforward and easy. Prepare a baking sheet by lining with parchment paper. Melt the orange candy melts in a microwave safe bowl at 50% power, stirring every thirty seconds, until completely melted. Dip the Oreos in the candy using a fork, coating them completely, then tap the fork on the side of the bowl a few times to shake off the excess candy. Gently place the Oreos on the prepared baking sheet. Melt the green candy melts in a microwave safe bowl at 50% power, stirring every thirty seconds, until completely melted. 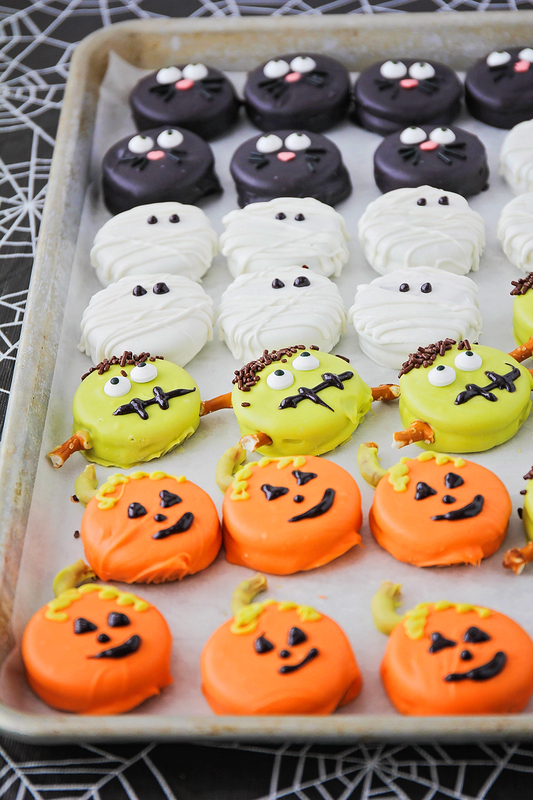 Dip the pretzel pieces in the green candy and stick to the top of the pumpkins. Drizzle the remaining green candy melts on top of the pumpkins to look like vines. Let cool and harden completely, then draw a face on each pumpkin using the sparkle gel. These cute little cats were definitely the most challenging to make, mostly because they required the most precision. I saw these cuties on 30 Handmade Days a few weeks ago, and couldn't wait to try them! My husband and my daughter Lizzy loved these ones the best, and I can see why. They are so darling! Prepare a baking sheet by lining with parchment paper. Melt the black candy melts in a microwave safe bowl at 50% power, stirring every thirty seconds, until completely melted. Dip the Oreos in the candy using a fork, coating them completely, then tap the fork on the side of the bowl a few times to shake off the excess candy. Gently place the Oreos on the prepared baking sheet. Place two candy eyes, two chocolate chip ears, a heart sprinkle nose, and six whiskers on each Oreo while the candy is still melted. Let cool completely. Lastly, these mummies are pretty tough contenders for my favorites, mainly because they were so easy to make. They definitely took me the least time of the bunch, and I still think they are incredibly adorable and so fun! Prepare a baking sheet by lining with parchment paper. Melt the white candy melts in a microwave safe bowl at 50% power, stirring every thirty seconds, until completely melted. Dip the Oreos in the candy using a fork, coating them completely, then tap the fork on the side of the bowl a few times to shake off the excess candy. Gently place the Oreos on the prepared baking sheet. Let stand 5-10 minutes. 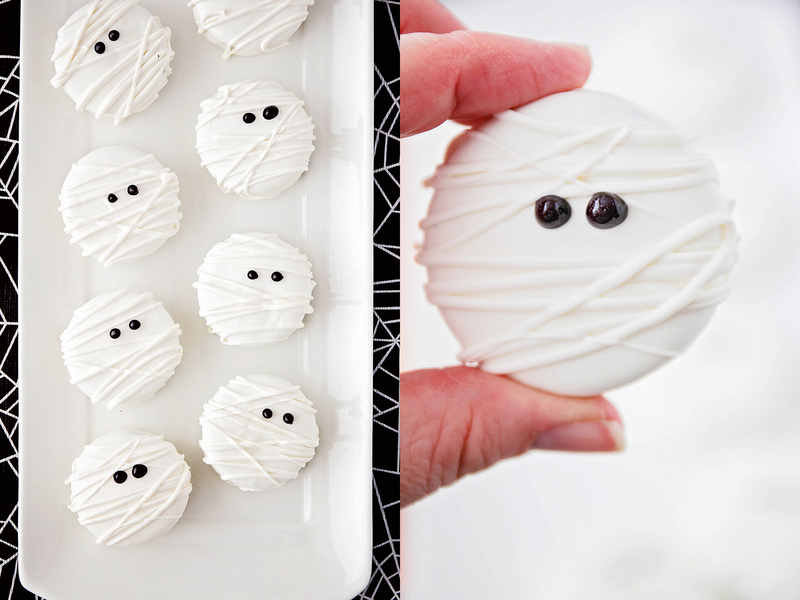 Scoop the remaining candy into a ziplock bag, cut a small piece off the corner of the bag, and drizzle the candy over the top of the mummies. Let cool completely. Pipe two black dots for eyes using the black sparkle gel. 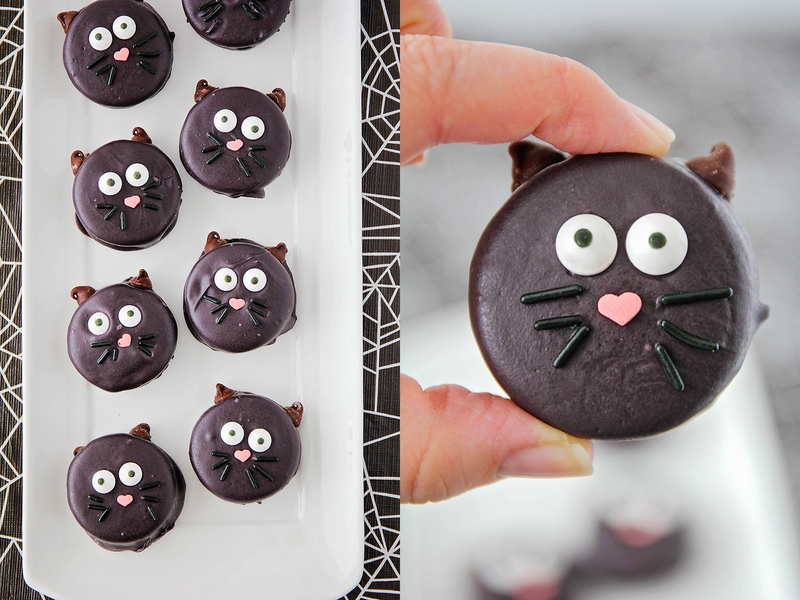 These Halloween Oreos are so easy to make, and perfect for celebrating the holiday!